trolling passes that can be duplicated over and over again. Late season walleye are interesting creatures. To catch these fish consistently you don’t have to launch in the pre-dawn. Those 5 a.m. curtain calls are pretty important during the dog days of summer, but in the fall walleye tend to bite low, slow and the best bite is often during the middle of the day. 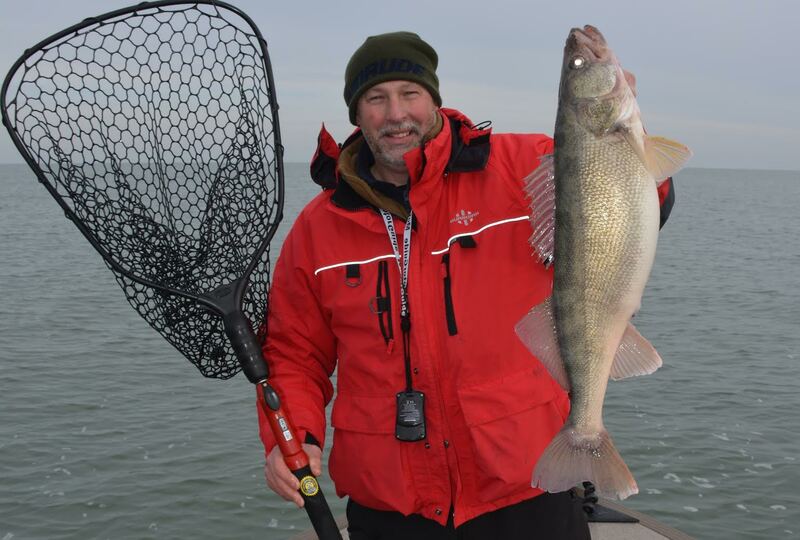 Across the Great Lakes, fall walleye fishing peaks as water temperatures dip down. It’s a safe bet that some of the best open water walleye trolling of the year will take place in the month of November. In places like Lake Erie, Saginaw Bay, Green Bay and Little Bay de Noc most of these fish are going to be suspending in the water column 20 to 40 feet down. Reaching these fish calls for a two prong crankbait trolling approach. Deep diving crankbaits are one of the most popular ways that anglers tip the odds of success in their favor. Interestingly enough the list of diving crankbaits that routinely produce fall walleye is a short one. The 800 series Reef Runner leads the pack, but the Rapala Deep Husky Jerk 12, 25A Bomber and Deep Yo-Zuri Crystal Minnow also have their days. All these baits are similar in that they feature a long slender minnow profile and these baits dive deep enough to be useful in an open water bite. Minnow divers do a pretty good job of imitating the larger forage fish walleye are keying on in the fall. Targeting larger forage species like gizzard shad, alewives and smelt provide walleye with the maximum food value, while expelling the least amount of energy. The second crankbait trolling approach centers on the use of shallow diving stickbaits like the Rapala Husky Jerk 14 and Smithwick Perfect 10 fished in combination with lead core line to increase the diving depth of these baits. Sinking lines like lead core do a nice job of taking these shallow diving baits to walleye suspended deep below the surface. the best open water walleye trolling in the fall. times to be on the water in November. Recently the staff of Precision Trolling Data, LLC tested the diving depths of these stickbaits when fished on two, three and five colors of lead core line. The data focuses on using a set amount of lead core line with a pre-determined trolling speed then metering the amount of backing line played out to control the running depth of popular stickbaits. This data will soon be added to the popular Precision Trolling Data iPhone and Android phone apps. For more details visit www.precisiontrollingdata.com. Trolling with lead core has some interesting advantages. Because lead core has minimal stretch, bites are converted into a higher percentage of hooked fish compared to monofilament trolling. Also, because monofilament line is buoyant most of the line is floating on the surface. The combination of the diving lure and buoyant line creates a “bow” in the line that must be pulled tight before a fish that bites can be solidly hooked. This delay in the hook up often provides walleye and other fish an opportunity to recognize the mistake and drop the bait before the line pulls tight. Conversely, lead core line sinks and plays into the water at a gradually declining angle. The second a fish touches a lure fished on lead core line it’s hooked. Both monofilament and sinking lines like lead core play major rolls in trolling for fall walleye. 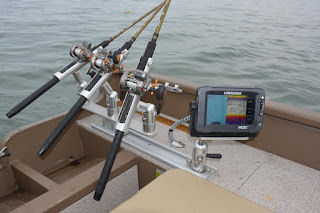 Another critical aspect is using in-line boards like the famous Off Shore Tackle Side-Planer to spread out lines and cover the maximum amount of water. Open water walleye that are suspended below the surface can be caught on flat lines, but the board lines day in and day out produce the majority of the bites. Trolling speed plays a big role in fall walleye fishing success. Slower trolling speeds are required to trigger bites in cool to cold water. As always, experimenting with a range of trolling speeds is an important triggering element. The range in trolling speeds for late season walleye starts at about 1.8 MPH on the fast side and dips down to as slow as 1.0 MPH. in the precise trolling depths of his crankbaits. Slower trolling speeds generate a more subtle action on crankbaits. The other advantage of trolling slower is walleye get a longer look at the baits as they pass through the school. Not every walleye is in a biting mood and often anglers must troll through hundreds and sometimes thousands of fish to generate a handful of bites. The good news is these fall crankbait fish tend to much bigger in size. At times fall walleye are red hot and the bite can rival the best spring fishing in terms of numbers. More often however the fall trolling bite is best described as slow, but steady. In a typical day on the water, it’s possible to boat a three or four man limit of fish, but on average boating six to 12 fish is more par for the course. While the number of bites may be smaller, the size of the fish is almost certain to be significantly larger than fish caught in the spring and summer. Often the best fishing takes place from mid morning to late afternoon. Late season Indian summer weather not only makes for pleasant conditions on the lake, some of the best fishing occurs in these rare stretches of stable weather. 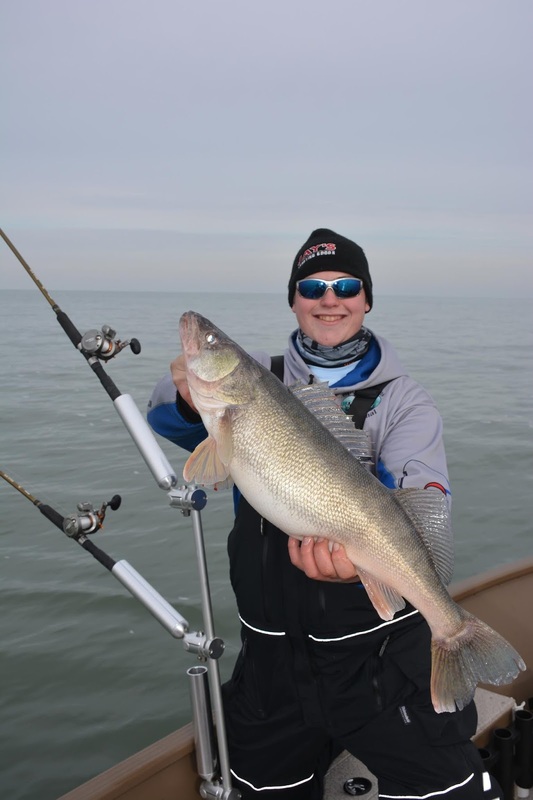 Open water trolling for Great Lakes walleye in the fall certainly isn’t a slam dunk. The bites may be slow in coming, but when a fish hooks up it’s likely to be a memory that won’t fade anytime soon.